Are you looking for a solid cup of coffee? Well, you can find that and much more at Always Brewing Detroit. This cozy coffee house is located in the Grandmont-Rosedale Community (Detroit MI). They are serving up Fair-trade coffee from Chazzano Coffee Roasters which is freshly roasted in Ferndale, MI. All pastries, milk products, and food are derived from local sources. Some of these sources include: Fresh Corner Cafe, Soup from Corktown’s own Brooklyn Street Local, Detroit Institute of Bagels and Love & Buttercream. This is keeping it fresh for customers and gives back to the community. Gotta love that. Right? 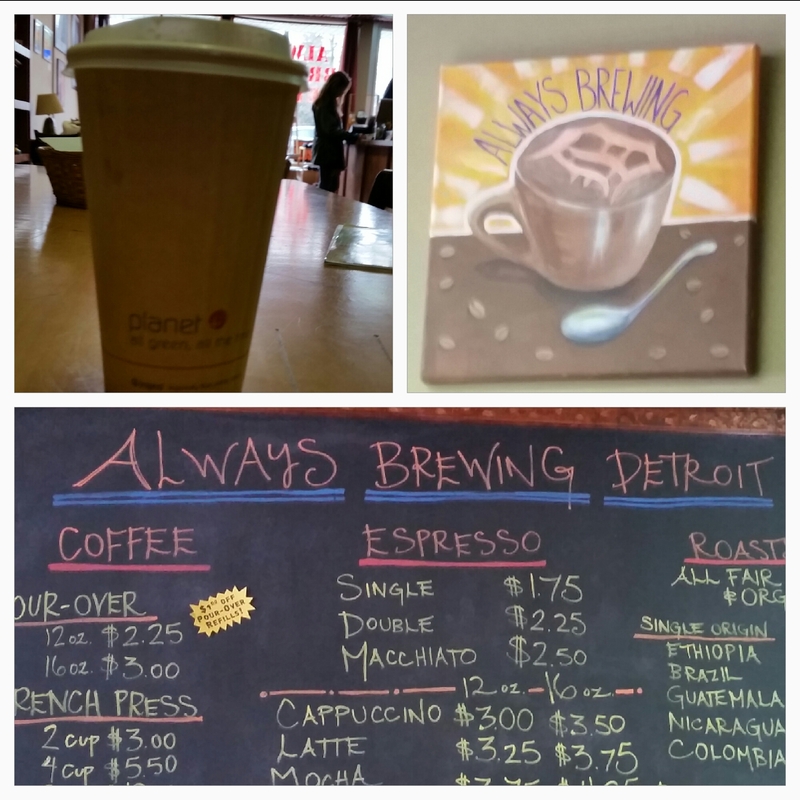 Speaking of Community, that is certainly the focus at Always Brewing Detroit. The owner, Amanda Brewington provides a creative community space for local artists to share their talents during open mic night. You can also find art work from local talents, a good book and even drop in for a yoga class each week. What a cool way to use a space and enjoy coffee too! I had the pleasure of meeting Ms. Brewington. She was super nice and personally made me a “mean mocha” 🙂 It was superb! If you are looking for a place to wind down, meet a few friends or colleagues Always Brewing Detroit is the place to go! Categories: Uncategorized | Tags: Always Brewing Detroit, Amanda Brewington, art, bagels, breve latte, coffee, Detroit, Eli Tea, Ferndale MI, Fresh Corner Cafe, java, latte, Love and Buttercream, music, Rosedale Community, soup. Chazzano Coffee, wraps sandwiches, yoga | Permalink.